Air plant is epiphytic, meaning that it lives by absorbing water and nutrients through its leaves, rather than from soil. In its native Central and South America, Tillandsia grows on trees, using its small roots to anchor itself on a tree branch. Because of its aerial lifestyle in the tropics, this type of epiphyte should not be planted in ordinary potting mix which will cause its small roots to rot. 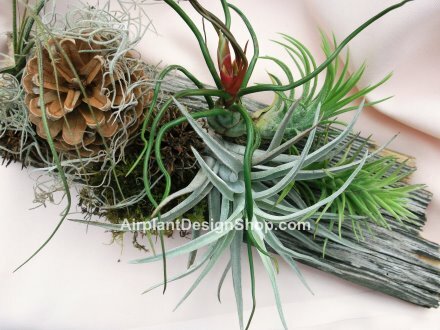 Air plants can be grown in crevices or depressions of a gnarled piece of wood, wired onto a twig wreath with enameled florists' wire, or tucked into a seashell. Put the plant's roots on sphagnum moss to keep them from drying out. Do not use treated wood, or driftwood that may contain sea salt. These rootless wonders allow many creative possibilities for how to grow them. 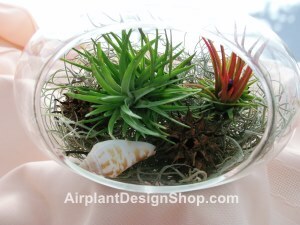 You can buy the airplant designs shown here (and many more) at Airplant Design Shop. These stylish arrangements are sure to grab attention wherever you display them. I'm loving mine. This tropical house plant from the Bromeliad family grows in a rosette of arching thin, green leaves, with deep pink or red plume-like bracts, and violet-blue flowers that appear in summer. No blooms? Plants that don't bloom are likely just too young. You can expect your plant to bloom when mature, which can take about 3 years. Another reason for no flowers is lack of sufficient light. 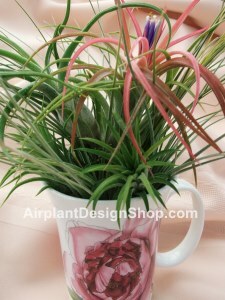 Move your air plant to a brighter location, but avoid hot, direct sun which can scorch the foliage. Air plants love air. Big surprise. Putting them in a spot where they'll get good air circulation allows the leaves to dry between waterings, just as they would in the wild. An open window (when it's warm) or a ceiling fan can help. 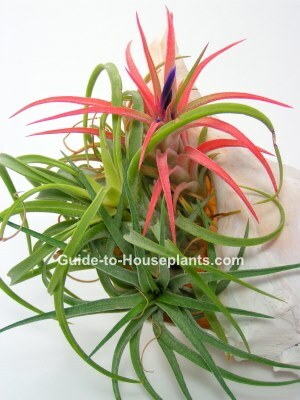 Tillandsia only lives for about 5 years, then deteriorates after blooming. However, it grows offsets -- called pups -- around the parent plant. Leave these pups attached until they are about half the size of the parent plant. Propagating pups will give you an ongoing collection of beautiful plants. Light: Bright, indirect light. These tropical beauties also thrive under fluorescent lights, making them good office plants. Water: Spray plants twice a week, until they are thoroughly wet. Or you can take them to the sink and run water over them. DO NOT soak them. Turn plants upside down to allow excess water to run off. Standing water at the base of the leaves will cause them to rot. Humidity: Moderate to high -- 50% relative humidity or above. Brown leaf tips are caused by dry air. Use a humidity tray, room humidifier or mist the plants with tepid water. 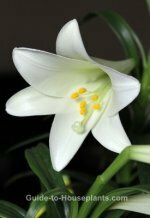 Temperature: Spring through early fall, average to warm 65-80°F/18-27°C; In winter, a cool rest 60°F/16°C will help it bloom in summer. Fertilizer: Feed once a month with foliar fertilizer specially made for air plants. Propagation: Detach offsets when they reach half the size of the parent plant and reposition as needed to make room for new growth.